See also the newer post about cycling with babies and toddlers! 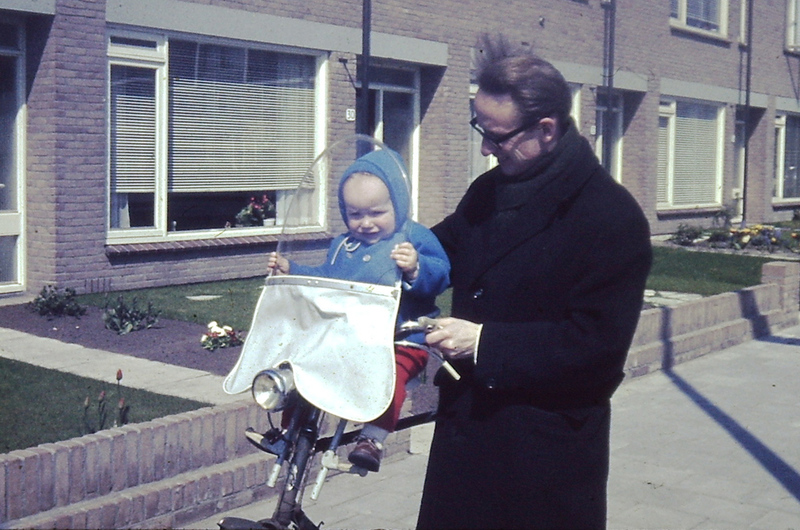 My video shows Dutch parents carrying their babies on their bicycles. I haven’t found any Dutch expert advising against this common practice. The only warnings I found were against carrying your baby on your body in a baby carrier bag on either front or back. Because in case of a fall you would then land on top of your baby. 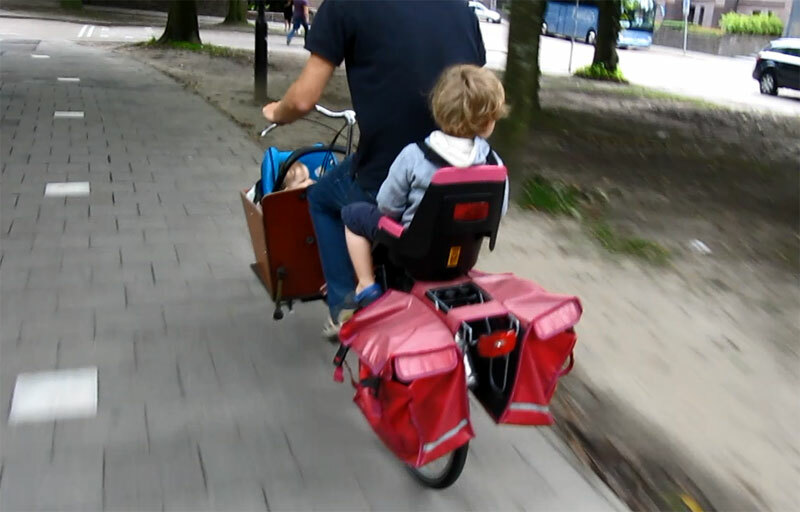 However, even though experts advise against this, in the streets of the Netherlands you will find a lot of parents who do carry their baby on their bodies while cycling. No wonder that in the US people are warned that if they decide to transport their children on their bikes they “will be judged“. And it is not much different in Australia. The Dutch advice couldn’t be more different. To parents worrying if they can transport their baby safely on a bicycle, the response is: “Sure! Just cycle away!” So what are the tips Dutch experts give? In what ever way you transport your baby on a bicycle, don’t take them too long! When seated on a bicycle a baby can’t move much, so the blood flow might suffer. One hour is safe but then there should be some other physical activity to get the blood flow going again. If your baby cries or shows in any other way that it doesn’t like being in the seat on the bicycle, the tour has to stop right away. If your baby is not able to sit upright on its own yet, it can be transported in a so-called baby mee (baby-along) on which you can mount a maxi-cosi to the rear luggage carrier. The manufacturer advises it for use with babies from 2 months old. Disadvantage: your baby is in a very high position, there is no weather protection and even with the suspension it could still be shaky. (For that reason the Dutch Cyclists’ Union advises to also cycle with slightly deflated tyres.) But the all around seat and the carrier handle put in an upright position do protect the baby in case of a fall. A baby trailer is much lower and better protected from weather conditions (with a cover on the trailer) but your baby is not in view behind you. On the other hand a trailer seats more than one child. That is also true for a bakfiets: there are also adaptors to mount a maxi-cosi to a bakfiets. In which case you can then see your baby in front of you. But not everybody wants to have a bakfiets of course. They are larger than an ordinary bicycle and that could be a problem when you need to store it. Typical Dutch dad transporting kids on a bike. You can just see his young baby in the box of his bakfiets in a mounted maxi-cosi. His older son sits in the rear seat. Clearly visible are the black straps with which this child is strapped to the seat. Dutch parents are encouraged to carry their babies from about 6 to 9 months, who are able to sit upright themselves, in a front seat mounted on the handle bars. These front mounted seats can be used until the child weighs about 15 kg which is at the age of about 3 years old. In good seats you are able to strap your child securely to the seat. And it is also very important that the feet are protected. To further increase the comfort of your child a transparent wind shield can be mounted to the seat as well. Bigger children can only be carried on the back. The back seats can transport children up to about 22kg, generally the equivalent of a 6 year-old. For rear seats it is even more important that the feet are protected, as the child’s feet are right next to the fast-moving spokes. In the past, many Dutch children suffered awful wounds to their heels when they got caught in the spokes. Modern seats prevent that from happening. It may also be important to cover the springs of the saddle. So children will not get caught in these springs with their fingers. The main reason the Dutch can safely transport their babies on their bicycles is of course because there is a dense network of safe cycle routes. Not only are there protected cycle paths away from traffic (29,000 kilometres) but also many 30km/h zones (over 30,000 kilometres). If you come from a country where that is different, you may look at the Dutch and their kids on their bikes with surprise. Already in 2006 a foreign observer published an account on the internet of how the Dutch transport their children. Under the heading “multiple riders”, Brian from the Bay area in California keeps referring to the front seat as the “suicide position”. I think almost nobody in the Netherlands would agree with that term. Other Americans are more informed and transport their own children on Dutch bikes in Amsterdam. On his blog, Ryan Cooper, who is originally from Detroit, first described how he rediscovered freedom when his daughter was finally old enough to be in the front seat on his bike. And then he published a lovely video about an outing to an Amsterdam Park. There is also a wonderful post by Henry from WorkCycles about taking his kids on a trip in a bakfiets. He also wrote about carrying newborns on a bicycle. Recommended reading! I had this post lined up for a later date but I pushed it forward because this week my attention was drawn to a magnificent video by a band from Groningen that I just have to share here. They do a far better job than I do in portraying Dutch parents cycling with their children and it works especially well because they never meant to do that. This unintentionally underlines the normalcy of this type of transport! Anthony’s Putsch – King of the world – Beautiful parents with their beautiful children! Isn’t it amazing how completely unaware the average Dutch person is about how special the cycling culture of the Netherlands is! It is a strong point that cycling and everything connected to it is so normal, but at the same time there is a risk the Dutch might lose it, because why would you fight to keep something you don’t even notice is special. But that may be a topic for an entirely different blog post some day! Hi there. Where is your evidence that it is “very dangerous to ride without a helmet”? Isn’t this something of a rash statement given the amount of debate on the topic? L’ll be honest: I stopped reading your article there because I don’t feel that anything you write after that can be trusted. I don’t know what you are referring to. Who claims that it is “very dangerous to ride without a helmet”? I certainly don’t! Pingback: When Can I Bike With My Baby? I wonder if you taken any children cycling in any of the ways like this. Happy babies are cute. Sad or angry ones, not that much. Interesting that you have memories from 1966, given that you were about a year old, maybe less, most people have no idea what they did as infants from their memory. When listening to your dad or mom or other people who were grown up then, or reviewing pictures, then you have a clue what happened. I imagine you were less happy in the car, on the times you did ride as a passenger or drive yourself, possibly because you don’t get the feeling of the wind through what’s left of your hair (I hope you interpret this as a compliment, as age usually breeds wisdom). Great article; just a slight disagreeance with the comment about Australia. We bike with our babies in our beautiful weather all the time! I’ve never ever heard anyone ‘judging’ another for exercising with their children?!? And I’ve been ‘dinking’ my children (3) since 2008. Thanks for your post. I live in Toronto where you don’t always see people biking with younger babies and this info helped me buy a front seat for my now 15 month old baby. She loves it so much! When we get to where we are going she cries when she comes off because she wants to be back on the bike. Thanks for the blog. Meagan, can you help me find bike part suppliers in Saskatchewan – or where I can order parts from? I have a 3.5 year-old and have been carrying her right behind me on a cargo-type seat but without the wheel guard, foot rest, mini handle bar etc and almost got reported to Social Services yesterday. Thanks for that. I’ll certainly bare it in mind when our baby comes along which should be a couple of months away now. Hoping to take the little fellow out on the bike. Might get a trailer instead though. They look safer. Nice and very useful info! We sell child seats and Dutch Bikes every day in Brooklyn @Rolling Orange Bikes and it gets better every day. Safer bike lanes and CitiBike help a lot. Currently using a bobike mini with a windscreen for our 13mo girl. She loves it, but only short trips (she does ok on an hour long ride, but not more). We also have a trailer, but she’s a bit small for that right now. we cycled with our baby, but with @tagabikes Dutch made, love it. cycled with baby on three wheels) oh, and we got a Christiana cargobike too. Sigh, this is a very smart mechanical engineer making this comment. Of course this sparked a lot of emails back and forth. How can she think the US is more safety conscious, when we design roads with very little safety in mind? It is sad when people here in my area think all you need is a helmet and magically you are safe, when the real safety issue is poor infrastructure, drunk, distracted and sleeping drivers (as how many here in SoCal have met their fate this year). OK, I need to watch the video again to get back to my happy place…and excellent post as always. Margaret, your reasoning is off-track–it may be true that U.S. road engineers can do better, but the inference made was that the Dutch children would be better served if their parents put helmets on them. Europeans pride themselves on being “advanced” societies, yet they can be slackers when it comes to safety on bikes, as well as in cars. How do I know? I’ve traveled extensively in Europe and have European relatives and friends and we discuss this issue. Let me tell you from personal experience; those Dutch cobblestone roads can be treacherous to ride on and helmets would be a good idea for both baby and parent. To each his own, of course. Don’t be a slacker then and stay wherever you live/are and leave us Dutchies in helmettless peace. I live in the Netherlands for the last 10 months and I have seen at least one accident happening every month. In the UK I might have seen the aftermaths of many, but I never saw a single accident happening in the last years. The Dutch are no superhumans when it comes to driving and cycling either and I will keep my helmet on no matter how much any Dutch self proclaimed road safety expert advises against one. My sister and I were carried to nursery school on the back of a Pashley Trike in Kent. I don’t remember it, but my mum speaks of it very fondly. Cycling around with my daughter in the frontseat belongs to the best memories I have of their childhood. It also prepares them for their own cycling in city traffic. When you only take the safety argument into account you’re not acting in their best interest. Unless the only thing you want is to prepare them for a future with cars, which is -so to speak- a dead end street. I tried to put my son in a front seat on a ‘white bike’ in the Hoge Veluwe park last year but he was only 3.5 months at the time so couldn’t sit up straight! Since then, back in the UK, I’ve bought a rear seat (a Co-Pilot Taxi – highly recommended) which he loves. Interestingly, I find car drivers are a lot more considerate when I’ve got the child seat on the back of my bike – regardless of whether my son’s actually in it! Not just in The Netherlands! Here is a fascinating video of Japanese mothers carrying their little children on the Japanese “Mamachari” bicycles. Note: I recommend skipping the first 1:15 of the presenter yapping about the Mamachari (which is essentially identical to a Moederfiets except it is made in Japan) and go straight to the video. Cycling with one and sometimes even two children on a bicycle is also popular in Japan. Not only popular, but essential as the bicycle is the primary means of transport for millions. I have fond memories of cycling around with my daughters when they were younger. The forward seating position allows you to easily hold a conversation with your child and point out interesting things along the way. I can not understand why so many foreigners living in Japan continue to insist that cycling with children is dangerous. For Japanese cycling is as natural as walking. I just got one Bobike baby seat for my 19months old son. He loves it! Last year we had an adventure. I carried him in mei tai on my back. He also loved it, but I didn’t felt safe as you said in your text. 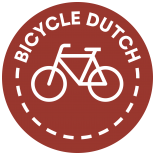 This entry was posted on 4 July 2013 by Bicycle Dutch in Original posts and tagged bicycle culture, children.